Our aluminum signs are very durable and can be used indoors and outdoors. They bring a rugged and high-tech feel to indoor environments, such as office spaces or trade shows. And they're a lot less likely to become damaged than foam based mounting materials. Both the aluminum and the adhesive backed vinyl prints d up well in the elements, so they're very popular for long-term outdoor sign and display applications, such as constructions signs, fence signs, road signs, safety signs, restaurant signage, and other outdoor projects. We offer several thicknesses and print quality levels for our aluminum signs, so we are sure to have an aluminum sign to meet your quality and budget requirements. $7.50/sq. ft. $8.50/sq. ft. $10.50/sq. ft.
$8.50/sq. ft. $9.50/sq. ft. $11.50/sq. ft.
$9.50/sq. ft. $10.50/sq. ft. $12.50/sq. ft.
Add $1.50/sq. ft. Add $1.50/sq. ft. Add $1.50/sq. ft.
* Volume Pricing: If you are ordering several aluminum signs and the order will be over 500 sq. ft. of printing, please contact us for volume pricing and turn-around times. Our aluminum signs are cut down to size for no additional fee. Holes can be drilled into the aluminum for hanging if needed. 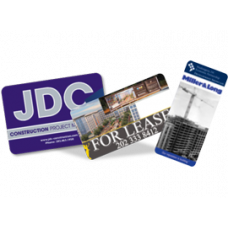 Lamination is another available option to give the print an extra layer of protection. If you have any questions, please contact one our account executives for help. We will ship your aluminum sign order in 3 business days from the time we receive your order and final print-ready design files, or proof approval if we are creating the design. Faster turn-around is available if needed, but rush fees may apply. Several shipping options from Ground to Priority Overnight are available to ensure your signs arrive on or before your due date. Contact us if you have any questions.